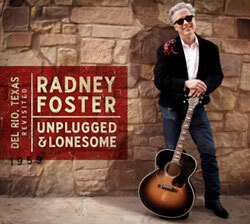 Radney Foster will celebrate the 20th anniversary of his classic album Del Rio, TX, 1959 with a new release called Del Rio, Texas, Revisited: Unplugged and Lonesome due out August 14. Foster made his solo artist debut with the original Del Rio collection, which featured the hits “Just Call Me Lonesome,” “Nobody Wins,” and “Easier Said Than Done.” The new album aims to reinvent the original with a looser feel and updated acoustic arrangements. “This time everyone was in the same room, with live takes with no fixes and no headphones,” says Steve Fishell, who produced the original Del Rio and played guitars on Revisited. “We have all new tempos and new grooves.” In addition to Fishell, guests on the new collection include Dixie Chick Martie McGuire (fiddle), Jon Randall Stewart (guitar), Glenn Fukunaga (doghouse bass), and Michael Ramos (keyboard). Pre-orders of Revisited are available here. For tour dates, check here.